The oldest instrument ever found is a flute (in a general sense) that is made from the bone of a vulture’s wing. It has been dated to around 30,000 to 40,000 years old. (There are older artifacts that some claim are parts of flutes but that is still being argued with great passion.) The top is an open tube with a v-notch on one side. The assumption is the player blew through the top of the tube down the v-notch while holding the flute vertically. This is a fairly well developed design that suggests this type of instrument dates from even earlier but finding anything older will likely prove tricky. 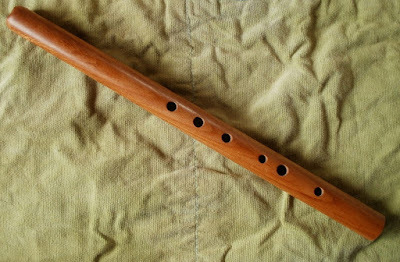 There are a number of current folk flutes that use similar "rim-blown" vertical designs and the history of the vertical flutes (and more than a few reed instruments) have been well and truly tied to the flute's history. But today the instrument we most often think of as a flute is the horizontally held concert flute or transverse flute. Bone was a common material for flutes and wind instruments for a long time. Some old flutes and reed instruments were named after the bones typically used to make them (the tibia is the name of a double reed instrument in Ancient Rome and there is a type of whistle called phalanges). Not too coincidentally, flutes and reed instruments were associated with sacrifices and religious ceremonies. Some cities kept wind players on an official payroll because they were required at religious ceremonies regularly. At the same time, they were often considered rural instruments that were played by country people and associated with nymphs and wild Gods who couldn’t quite be trusted. In many cultures, playing a wind instrument wasn’t as respectable as playing strings or singing. Girls and boys both could seriously damage their reputations by learning to play them. 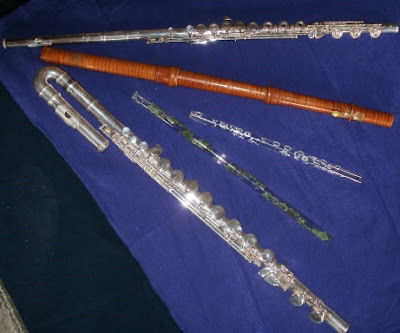 In fact, flutes have been made out of nearly any kind of material that can be made into a hollow tube. Wax, glass, clay, potatoes and carrots (I’m not making this up) are just some of the examples. The metal flute is a quite recent development and some modern performers still prefer wood instruments. One common compromise is for the head joint to be made of wood and the body of the flute to be metal. This generally gives it more of a wood sound, but makes the key-work more reliable and reduces the likelihood of the wood cracking. Nearly every culture has created several different styles of flute, including transverse types. But the transverse flute isn't recorded as being popular in Europe until the Baroque era. The most common theory is that some form of transverse flute from India or the Middle East made it's way to Europe during the Medieval crusades (not at all uncommon) and then slowly became more popular. There are several problems with this. One is that the examples of the flute that are used to show it "traveling" change design (and the direction the flute points) several times. This isn't a deal breaker since design changes happen all the time but it does make it less certain that that is how the transverse flute got to Europe. Another problem is that this theory ignores all the "folk" flutes in Europe, some of which were transverse. These folk flutes weren't written about or painted much because they were too unimportant and associated with the lower classes. Even during the Baroque and Classical era, many popular instruments were ignored because they were only being played by lower class "professional" musicians and not by the "amateur" upper-class musicians who didn't need to be paid (you have to remember that "professional" and "amateur" were social rankings not indications of how well you played and that being paid for a skill was automatically low class). My guess is that the folk flutes were influenced by the transverse flutes from the Middle East, India or even China as people moved back and forth in the Middle Ages. New music from other countries alone could have inspired new instrument designs and curious musicians usually do try new instruments whenever they can or think up ways of combining two different styles of instruments. All of this eventually led to a new type of transverse flute, the earliest version of the one we see in orchestras today. The historical European transverse flutes that we have records of seem to have been made in one or two pieces at first (headjoint and body). Later, they were generally made in 2, 3 or 4 sections so key-work could be added with less effort, to tune them in different ways and so they could be taken apart and stored more easily. The first key was added to the flute in the 1620s. This is also around the time the flute became more popular in Classical music and began to take over the role the recorder had held for years. It also matches up with when the scales and modes were changing and new tuning systems were coming into use. As the music kept changing, people kept adding keys to all the instruments. However, there was nearly no agreement about what keys were best to use, how they should be attached or even if they should be used at all. Again, this goes with the wide range of musical styles that were in use. There are so many different designs that I'm not even going to try to explain them all (some were quite wild). Theobold Boehm standardized the keys on the flute in the mid-1800s and adjusted the design to play Romantic music (as opposed to all the earlier stuff). Boehm's flute was then tweaked, adjusted, added to and generally changed several more times and metal flutes started turning up in the 1900s. All of these changes were bitterly argued over and there are still new keys, scale tunings and other changes being developed nearly every day. It is really an illusion that there is one standard type of concert flute in use. Some styles of music (trad. Irish and Historically Inspired Performance/HIP for example) use strictly older flute designs with few or no keys even today. Every change to the design of the flute, no matter how small, changes the sound of the instrument so it is hardly surprising that nearly all the older styles can be heard today. What's more, each musician sounds different on each flute so one flute may sound brassy, bright, haunting or lush when played by different people. And this is why I so enjoy meeting the different flutes in the world and in history!